Name of booth: Choya Umeshu o., Ltd. In order to allow more people in the world to know about “plum”, which has been popular among Japanese people from ancient times, CHOYA continue to develop new products. The CHOYA Ume Soda is a plum soda beverage with plums, sugar and soda water as ingredients. No other acidulants, colourings nor additives are used, therefore you are able to experience the solid yet refreshing taste of the Japanese plum. 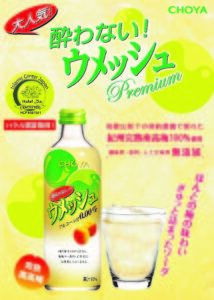 Feature: The CHOYA Ume Soda is a plum soda beverage with plums, sugar and soda water as ingredients. No other acidulants, colourings nor additives are used, therefore you are able to experience the solid yet refreshing taste of the Japanese plum.